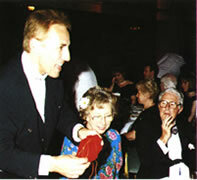 Mel entertaining the late Ernie Wise and company at the Grosvenor House Hotel, London. Mel is a master of close-up magic, a form of entertainment where the magician performs right under the noses of the audience. If you need someone to entertain your clients or entertain at a banquet, function, wedding reception or hospitality suite, Mel is your man! For details on how magic can be used in the corporate market, please see the corporate magic page. Mel is a regular performer in the Great Room at the Grosvenor House Hotel, Park Lane where he has entertained various celebrities from the late Ernie Wise to the cast of 'Birds of a Feather' for such clients as Mars & Co. (fourth year), Levingtons and Vauxhall motors. Mel has also performed at The Savoy and the Royal Lancaster Hotel for numerous black tie dinners. 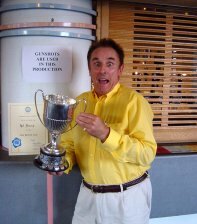 Recently at the International Brotherhood of Magicians convention at Eastbourne Mel scooped 1st prize and £1000 for his comedy close-up act. Click here to watch a small section of his winning act.